"Linguini is mixed with pieces of tender chicken and broccoli flowerets and coated with a rich, satiny Alfredo sauce featuring Campbell's® Condensed Cream of Mushroom Soup to make a quick and fabulous dish." Cook linguine according to package directions. Add broccoli for last 4 minutes of cooking time. Drain. Heat butter in skillet. Cook chicken until browned, stirring often. Add soup, milk, cheese, black pepper and linguine mixture and heat through. Serve with additional Parmesan cheese. This dish is delicious, and so easy with Campbell's® Cream of Mushroom Soup. *Or substitute spaghetti for linguine. Serve with a mixed green salad topped with grape tomatoes and balsamic vinaigrette. For dessert serve pear halves. What is up with people adding mushrooms to everything! Mushrooms don't belong in alfredo. 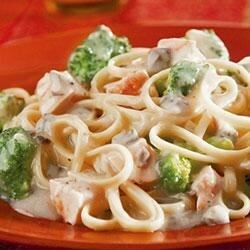 Alfredo should be creamy and cheesy. Very good and very easy to make. I think next time I would use less cheese and a little more broccoli to make it lighter. We added french bread and white wine to make it an easy meal!